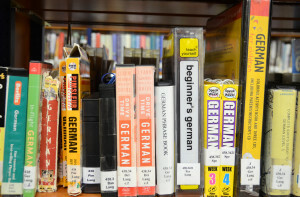 Your local Army library offers an array of tools to help you through the perils of a new language. Photo by Molly Hayden, USAG Bavaria Public Affairs. GRAFENWOEHR, Germany — Moving to a new country yields an obvious learning curve, and Germany is no exception. Driving on the autobahn for the first time often warrants a brief word with the Almighty, and seeing the word “Ausfahrt” larger than life will no doubt expel fits of laughter. Learning a new language can be overwhelming, but when it comes to your new surroundings, communication is often more than just words. With a few easy tips you’ll say “tschuess” to old habits and “hallo” to embracing new adventures. “Gruess Gott” is the standard welcome greeting in Southern Germany, and means “God greet thee.” Using this greeting in the North, however, may raise some eyebrows. (It would be like a Texan using “Howdy” in New York City). When in doubt, “Guten Morgen,” (good morning) “Guten Tag,” (good day) and “Guten Abend” (good evening) are all acceptable greetings Germany-wide. Bavarians also say “Servus” as a form of greeting (both for hello and good-bye). It is a word they learned from the Roman occupiers 2,000 years ago and literally means “servant.” Romans used to call out for “Servus” when they required service. At that time Bavarians thought it was a greeting, so it crept into the culture where it remains today. Have you ever had a German tell you something like “you will come here” or “you must sign there?” It sounds horribly impolite in English, like they’re ordering you around, (and we Americans do not like to be ordered around!) But the truth is, they are not. The issue stems from English and German being two completely different languages (and cultures), and while words sound similar, they may mean slightly different things. For example, the English “must” and the German “muessen” sound very much alike and even mean something similar – just not exactly the same. In English, “must” indicates a mandatory requirement or order (“you must do this, or else …”). In German, “Du musst” simply means “you have to” or “you need to.” It’s a poignant way to express the need. It’s a similar story with a statement like “you will come here.” Most likely, they’re trying to ask you politely to come with them. Next time you encounter such seeming impoliteness, don’t take it personally, especially if you notice that the German’s English isn’t the best. There is always a language barrier to take into account. No one expects Americans to step off a plane and speak fluent German, in fact, no one expects that to happen if you’ve lived here for five years. In the same manner, don’t assume everyone you encounter speaks English. Keeping it simple is the most effective way of getting your point across. For example, if you and your family are traveling through Germany and you’d like to ask someone to take a photograph, instead of bombarding a non-native English speaker with a mouthful of words, simply hold up the camera and say, “photo, please.” English-speaking or not, they will most likely understand your need. Hands are also an acceptable way of communicating. When at a bakery or restaurant, simply point to the item that you would like adding a “bitte” (thank you) for posterity. It’s also important to learn phrases like “Ich spreche nicht Deutsch” (I do not speak German), or “Sprechen Sie Englisch?” (Do you speak English?) to help set the tone of conversation. Those of you who speak German may have already had their encounters with the local dialect and it is not so easy to understand, even for other Bavarians! Below are a few basic words to help you fit in like an Oberpfaelzer. Leberkaese: Bavarian food specialty consisting of beef and pork and spices (but neither liver nor cheese as the name would suggest). Mass: 1 liter (1/4 gallon) of Bavarian beer, served in a Masskrug (large beer mug). Seidl: 1/2 liter (1/8 gallon) of Bavarian beer, served in a Seidlkruegl (small beer mug). damisch: Simply put, means crazy or unintelligent. Gaudi: This word means fun and originates from the Latin “gaudere” meaning to rejoice, be joyful, and take delight. Wolpertinger: This very rare animal is only found in Bavaria and is a crossing of several native animals. According to statements of witnesses, it also lives in the JMTC Training Area. Kirwa: A town fest in celebration of the consecration of a church. Dirndl: Traditional Bavarian dress for ladies. Lederhosen: Traditional Bavarian leather trousers for men. Schnodaheupfl: Rhyme-song in Bavarian dialect, at times containing bawdy (yet hilarious) content. With common expressions, Americans and Germans often say the same thing, but express it very differently. Below are a few common phrases in English followed by their German translations. It’s all Greek to me = Ich verstehe nur Bahnhof” (I only understand “Bahnhof”). I’m fed up with it = Ich habe die Nase voll” (I have the nose full). Keep your fingers crossed for me = Drueck mir die Daumen (press your thumbs for me). Don’t buy a pig in a poke = Kaufe nie die Katze im Sack (never buy the cat in the sack). A miss is as good as a mile = Knapp daneben ist auch vorbei (a near miss is still a miss). The early bird catches the worm = Morgenstund hat Gold im Mund (morning hour has gold in its mouth). Don’t trust the cat to save the cream = Mache nicht den Bock zum Gaertner (don’t make the goat a gardener). 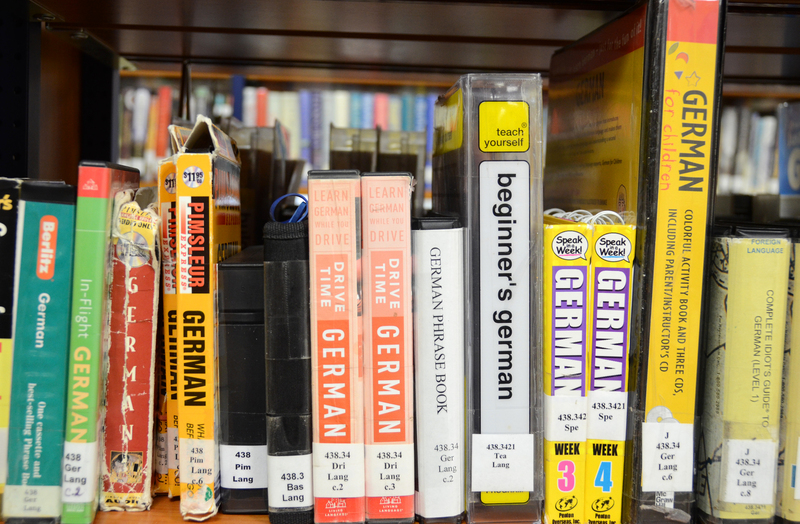 The libraries at USAG Bavaria provide a wealth of language resources. Learn more at www.library.eur.army.mil. Be sure to check out Rosetta Stone, the library’s free online language learning service.